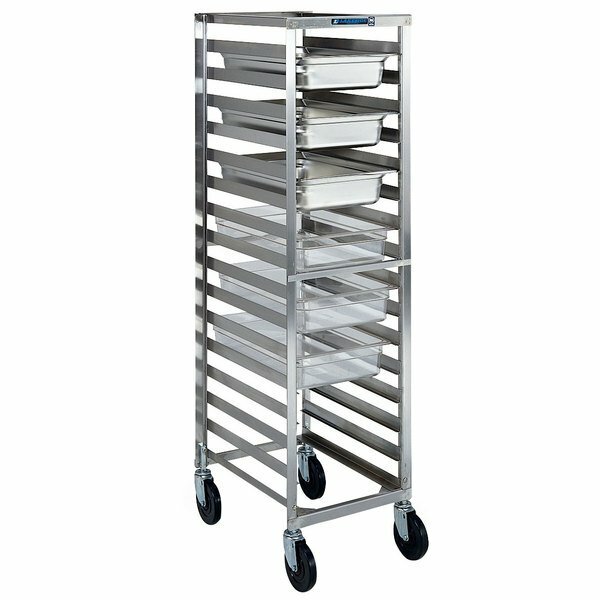 Made of heavy-duty, welded stainless steel, this Lakeside 180 stainless steel steam table pan rack offers the durability, mobility, and functionality that your business requires. Perfect for restaurants and catering companies, this steam table pan rack will help you save space with its narrow footprint, and keep your kitchen and refrigerator very well-organized. Its ability to thrive in cold, damp environments means you can wheel it right into a walk-in cooler and feel confident storing it there. Cleaning is a breeze now as well, since it is made of stainless steel. And the 16 welded, angle-style ledges can hold steam table pans filled to the brim with whatever is on today's menu. In addition, tie-bars are welded onto the uprights for additional integrity. Lakeglide 5" vinyl stem casters make transportation simple.